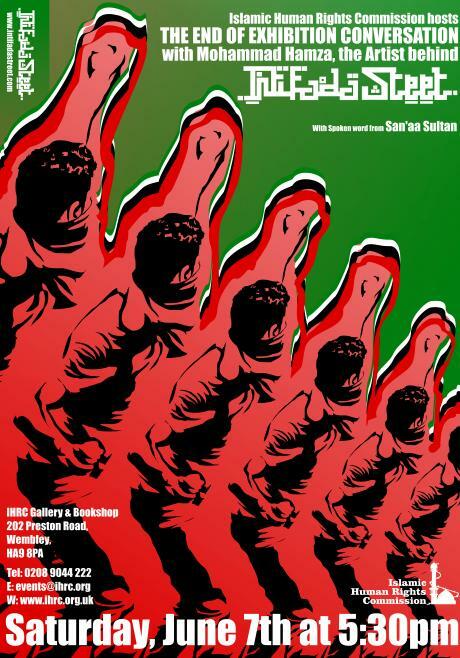 IHRC celebrate the end of Intifada Street artist Mohammad Hamza’s exhibition with discussion and poetry. Intifada Street is an explosion of artistic expression that aims to reflect the more than average discontent one feels about the injustice in the world. It owes a lot to the Resistance Art that has carried the fight in raising awareness of inequalities in the world for generations. Hamza is an independent activist, Bradford born-based artist, and the founder of Intifada Street. Intifada Street is an art company which strives to bring existence to some of the best artwork, which reflects Hamza’s distinctive soul. All artwork is done with CorelDRAW and attempts to reflect the struggling and oppressive cries around the world. Hamza’s personal heroes are also signified through his artwork, and his pro-Palestine stance is clearly shown. The end of the exhibition will be commemorated with a conversation with the artist – providing the audience with a clear insight of him as a person and the passion that rules his art. San’aa Sultan will also be at the event to recitie a few spoken word pieces.